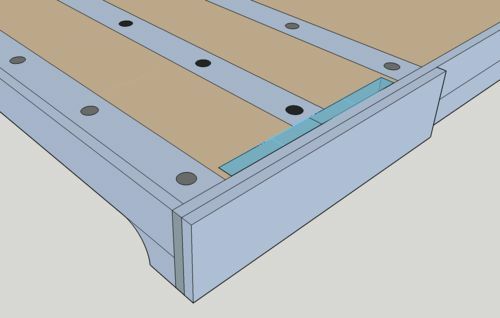 I am trying to decide on a layout for dog/holdfast holes in a new workbench top and am struggling a bit with getting an aesthetically appealing yet functional layout. If a vise has a centered dog, do you have to have dog holes above the vise screw? I would love to know from people with this layout if it is an issue. Would you do it that way again? 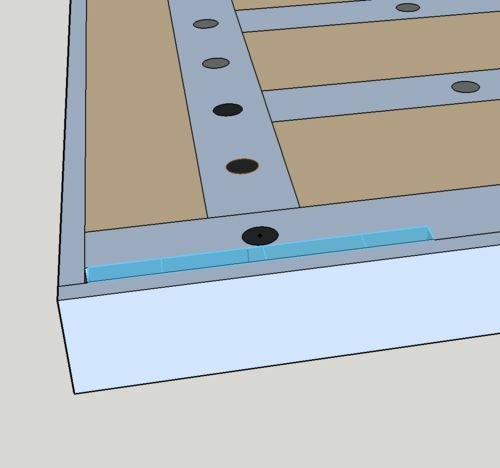 My bench top is made of laminated MDF, so I am inserting hardwood strips for the holes into the surface… problem is I can’t easily make new holes down the line, so I want to make sure I put the strips in the best place from the beginning. Thank you for any help or advice you can give! Both my vises have the centered dog, and I put the holes right down the bench over the screw.With my vise, that’s only a problem with the hole closest to the dog. On that one I can’t push the bench dog down below the table top because the vise base blocks the hole. What kind of vices will jo have and where will they be mounted? 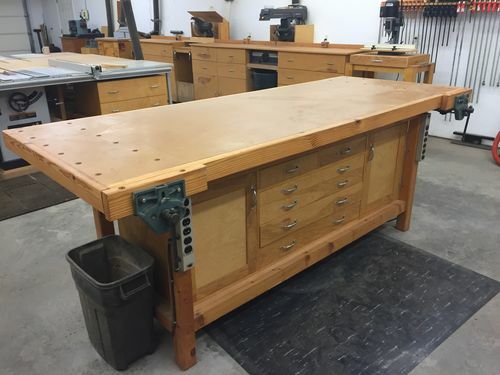 On my work bench I put two rows of dog holes right in front of each vice….I didn’t put any dog holes along the length of the bench….I didn’t feel it was necessary to have that many…. 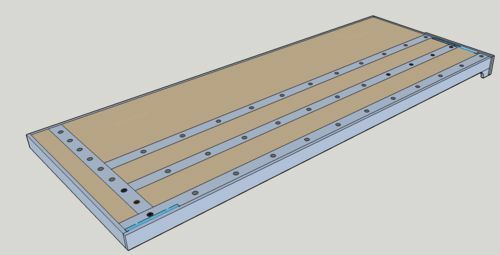 Rick – Is that an all MDF worktop? If so, how do the holes hold up? Do you use holdfasts? You may just start out with holes drilled directly into the MDF, and not drill them before you actually feel the need. When they starts to widen you may insert the hardwoood strips and make the holes then. You may also make a quite big hole and insert a hardwood dowel that you glue in place and drill the actual hole in. That way you may also add the holes as needed. Yes…...The bench top consist of 4 layers of MDF glued and screwed together to make a 3” thick top. To get the dog holes spaced evenly I built a jig to drill the holes evenly spaced apart. Clamped in place, I used a 3/4’ drill bit to punch all the way through the layers….If you don’t have a 3/4” bit, you could use a 3/4” spade bit that will do the trick…..! If you look at the vices, you’ll see I also drilled holes in the wooden “jaws” to line up exactly with the rest of the dog holes…….!! Then I routed a small chamfer around each hole to help prevent tear-out when inserting the dogs. I put 2 coats of clear Danish oil on, let that dry good, and 6 coats of polyurethane over that….That sealed everything up…..That was over 12 years ago, and it still looks pretty good…..!! And….I made my on dogs out of 3/4” dowels. And no, I don’t use holdfasts…There is not enough clearance between the bottom of the top and the cabinet below….only about 3”.